Pinoys are natural pet lovers. To date, the Philippines is one of the top 5 countries in the world with the most number of household pets. But gone are the days when pets are merely trusty watchdogs at home. Many owners have come to treat their pets as companions, friends and even as kids of their own. What used to be just veterinary clinics to give medical attention to our pets, now services are being offered for all sorts of our pet needs. From pet dental clinics, to grooming salons, obedience class for pets and even pet hotels. All are aimed to provide the best care for our beloved animal friends. But one important need for our pet is often overlooked- the need for a decent resting place when they pass on. 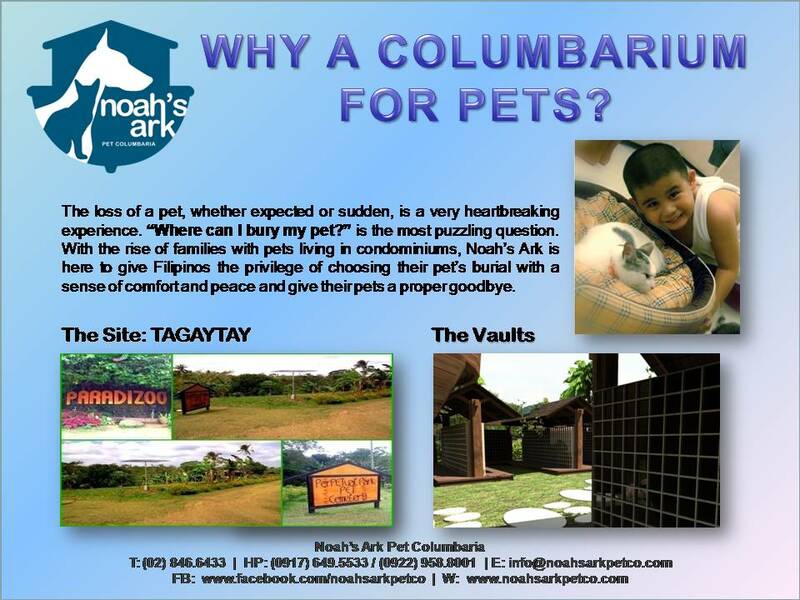 Last February 18, BM Cremation Services Inc. and Zoomanity Group, held a groundbreaking ceremonyfor Noah’s Ark, the very first pet columbaria in the country.The ceremony was held at the 300sqm area at Zoomanity’s Theme Park Paradizoo in Mendez, Cavite. Zoomanity President Robert L. Yupangco and Noah’s Ark Founder and President Tetet Zapanta-Huit signed a contract for the joint venture which coincided with the theme park’s celebration of the Animal Festival. Animal advocate and Noah’s Ark PR Executive Karla Kangleon shares she asked Zapanta-Huit to create a crematorium for pets when the latter started BM Cremation Services, a crematorium for humans, three years ago. “I’ve lost many pets through the years due to illnesses or old age. Each time a beloved pet passes away, I asked myself, ‘Where can I bury my pet?’ I later found out that it was also a frequently asked question by many of my relatives and friends who also had pets,” says Kangleon. 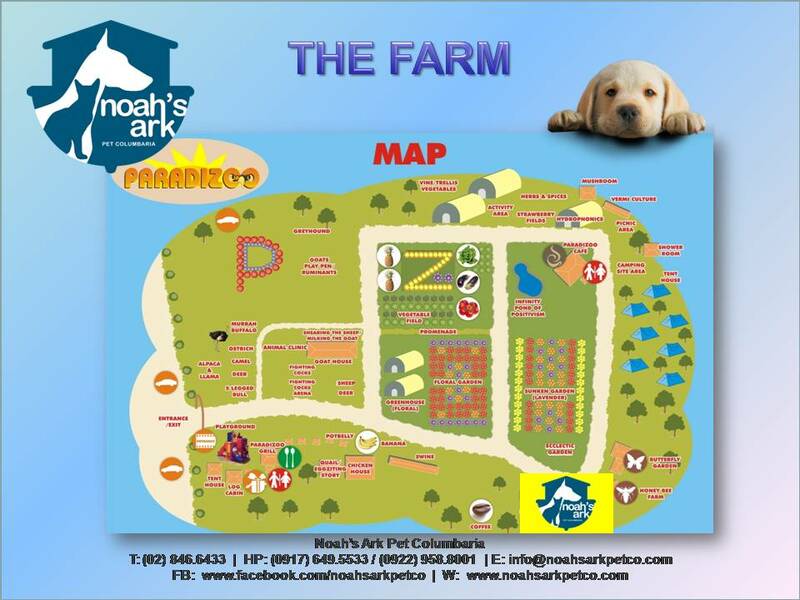 Noah’s Ark will be constructed within the Paradizoo Park vicinity. The garden themed pet columbaria will consist of 4000 vaults than can each fit ashes of dogs, cats and pocket pets. Owners of larger animals like horses may place their animal’s urns in three to four adjacent vaults. “The client has the option to place an urn in the niche initially and reserve the remaining spot for the pets they have at home. The client may also have the option to purchase a single vault as bonery for a single pet if they don’t want their pets cremated,” adds Zapanta-Huit. 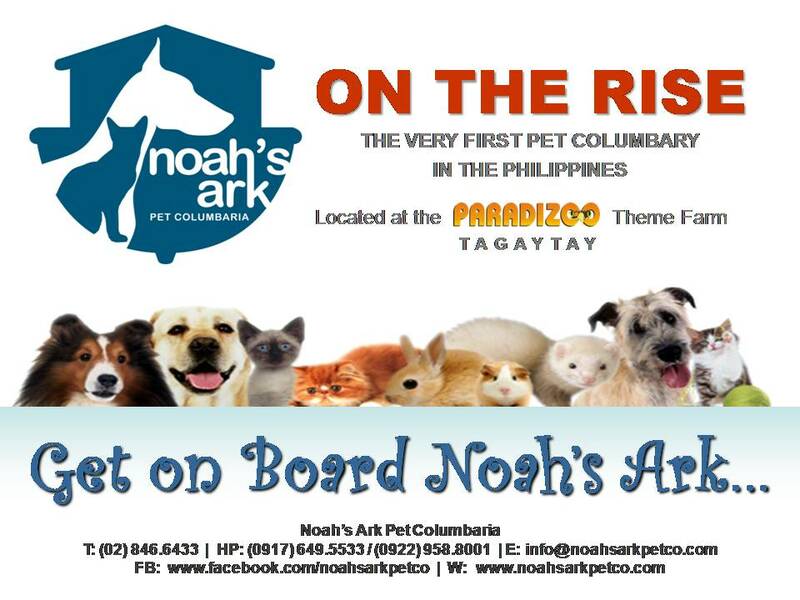 Not only will you give a decent resting place for your pets, you are also helping other unfortunate animals in the country as Noah’s Ark also advocates animal welfare. With every vault that you buy for your pets, proceeds will be donated to Cara Welfare Philippines and Philippine Animal Welfare Society (PAWS). “We want Noah’s Ark to positively affect the state of animal welfare in the country,” adds Zapanat-Huit. For most owners, pets are no longer just pets but as loyal family members that we truly care about. The bond between owners and pets can be very strong especially after sharing years of happiness together. Now this special bond can live even as our pets pass on. 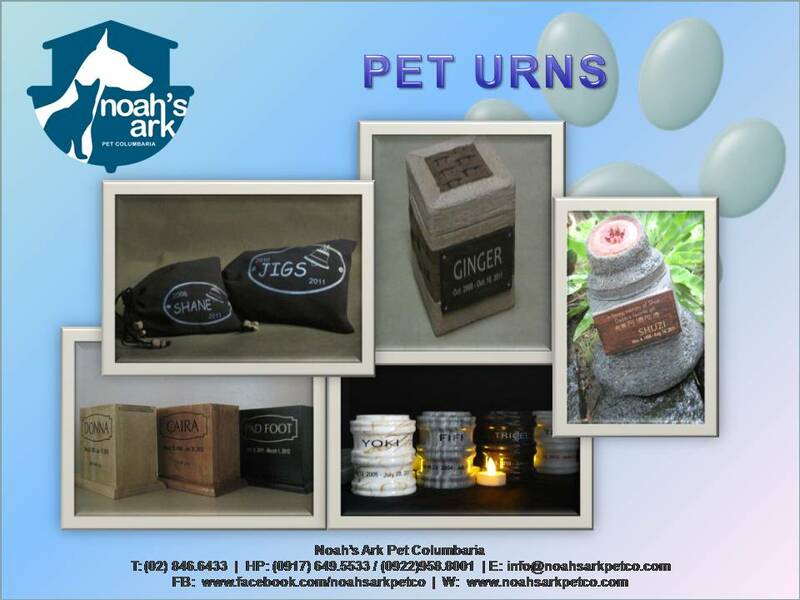 With the opening of Noah’s Ark soon, our trusty pets can get the love and affection they deserve while with us on earth and even in the life after. 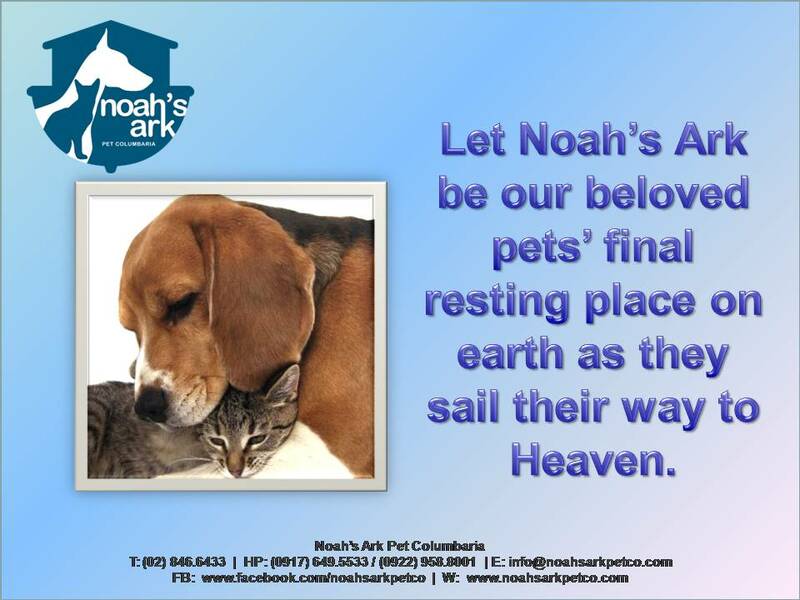 Let Noah’s Ark be your beloved pet’s final resting place on earth as it sails its way to Heaven. Own a vault now! For inquiries Contact Nos. (02)846-6433 /Globe (0916) 897-3677 or Sun (0922) 958-8001 Smart (0921)694-0328. PS. If only Noah’s Ark was already around when our dog died.